The Gemini South telescope during observations of the southern sky over Chile. For more images see the Gemini Image Gallery. 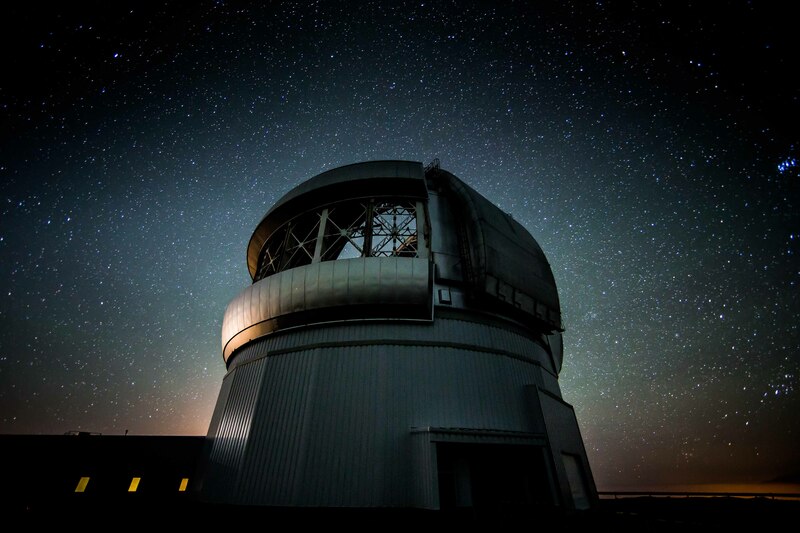 Spectroscopy using the Gemini Multi-Object Spectrograph on the Gemini South telescope in Chile verifies the extreme distance of one of the most distant superluminous supernovae ever studied. The following text is reproduced from the University of California Santa Cruz press release issued on July 21, 2017. The paper is available here. SANTA CRUZ, CA--The death of a massive star in a distant galaxy 10 billion years ago created a rare superluminous supernova that astronomers say is one of the most distant ever discovered. The brilliant explosion, more than three times as bright as the 100 billion stars of our Milky Way galaxy combined, occurred about 3.5 billion years after the big bang at a period known as "cosmic high noon," when the rate of star formation in the universe reached its peak. Previous observations of superluminous supernovae found they typically reside in lowmass or dwarf galaxies, which tend to be less enriched in metals than more massive galaxies. The host galaxy of DES15E2mlf, however, is a fairly massive, normal-looking galaxy. The Dark Energy Survey is a collaboration of more than 400 scientists from 26 institutions in seven countries. Its primary instrument, the 570-megapixel Dark Energy Camera, is mounted on the 4-meter Blanco telescope at the National Optical Astronomy Observatory's Cerro Tololo Inter-American Observatory in Chile, and its data are processed at the National Center for Supercomputing Applications at the University of Illinois at Urbana-Champaign. Funding for the DES Projects has been provided by the U.S. Department of Energy Office of Science, U.S. National Science Foundation, Ministry of Science and Education of Spain, Science and Technology Facilities Council of the United Kingdom, Higher Education Funding Council for England, ETH Zurich for Switzerland, National Center for Supercomputing Applications at the University of Illinois at Urbana- Champaign, Kavli Institute of Cosmological Physics at the University of Chicago, Center for Cosmology and Astro-Particle Physics at Ohio State University, Mitchell Institute for Fundamental Physics and Astronomy at Texas A&M University, Financiadora de Estudos e Projetos, Fundação Carlos Chagas Filho de Amparo à Pesquisa do Estado do Rio de Janeiro, Conselho Nacional de Desenvolvimento Científico e Tecnológico and Ministério da Ciência e Tecnologia, Deutsche Forschungsgemeinschaft, and the collaborating institutions in the Dark Energy Survey, the list of which can be found at www.darkenergysurvey.org/collaboration.